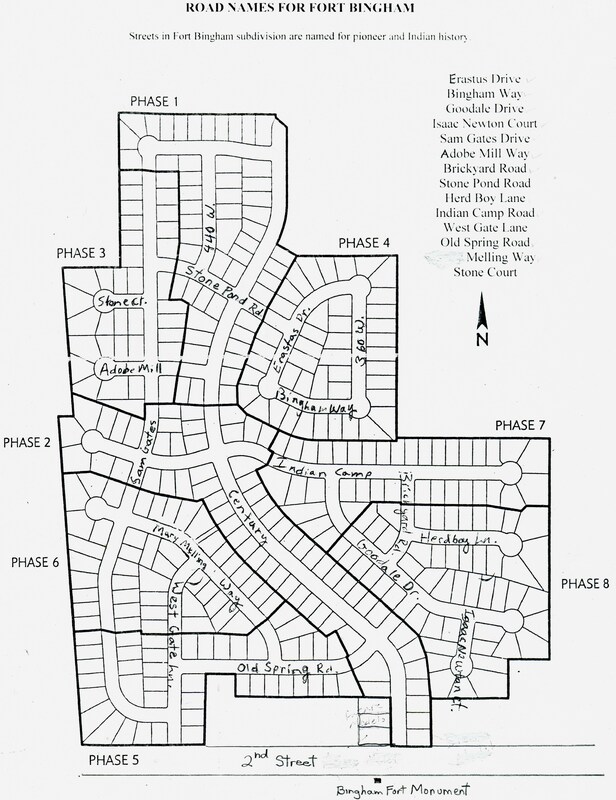 The subdivision began in 2004 on the sites of Sam Gates 1853 farm and old Indian camping grounds. Starting in 1849 pioneers began settling on today’s West 2nd Street. It is the spirit of the pioneers and Indians that prompted the developers to name the subdivision and the roads after pioneer home builders and Indian camps. In the first twenty years the pioneers built about 30-40 homes on 2nd from Five Points to 1200 West. The area of Fort Bingham Estates contained a very large pond in the 1850s, many natural springs and cottonwood trees, making it a natural camping ground for Indians. Sarah Stone recorded that the Indians lined their wicki-ups in straight lines here between the cottonwood trees. 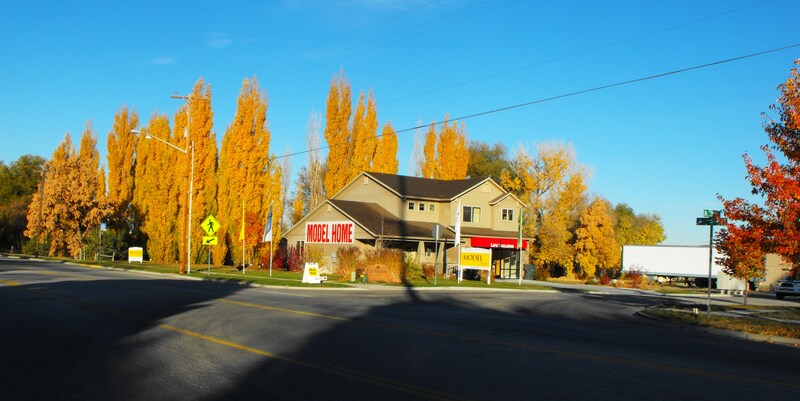 This image is a novel contrast to the rows of neat houses built in Fort Bingham starting in 2004. After the continental railroad arrived, there was an immigration of Italians on West 2nd Street that created a culturally distinct group of about 10 more families. Today’s large influx of 300 new homes is the third major settlement on West 2nd Street. The population of the subdivision is similar to the large population of Bingham’s Fort from 1853-1856, ranging from 500 to 600 people. 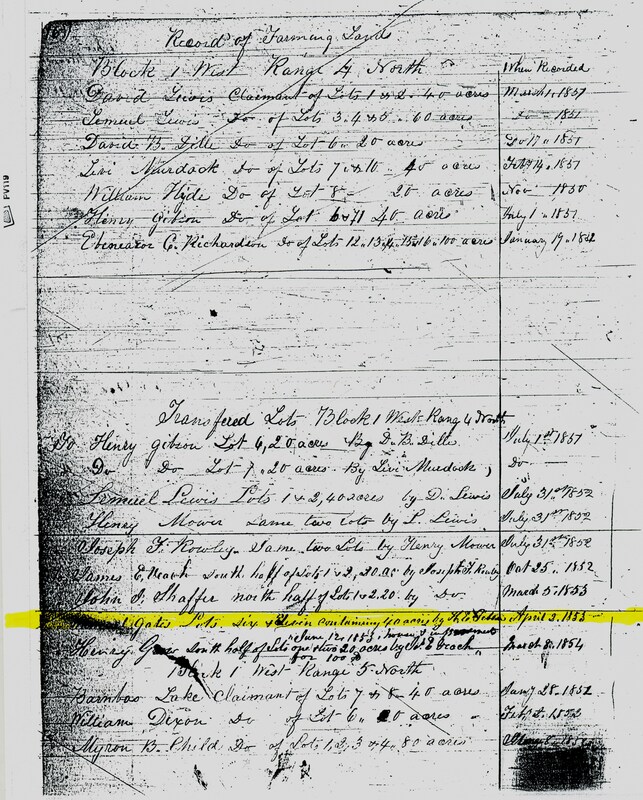 The first land record for today’s Fort Bingham land was made by Sam Gates in 1853 for 40 acres of farming land. 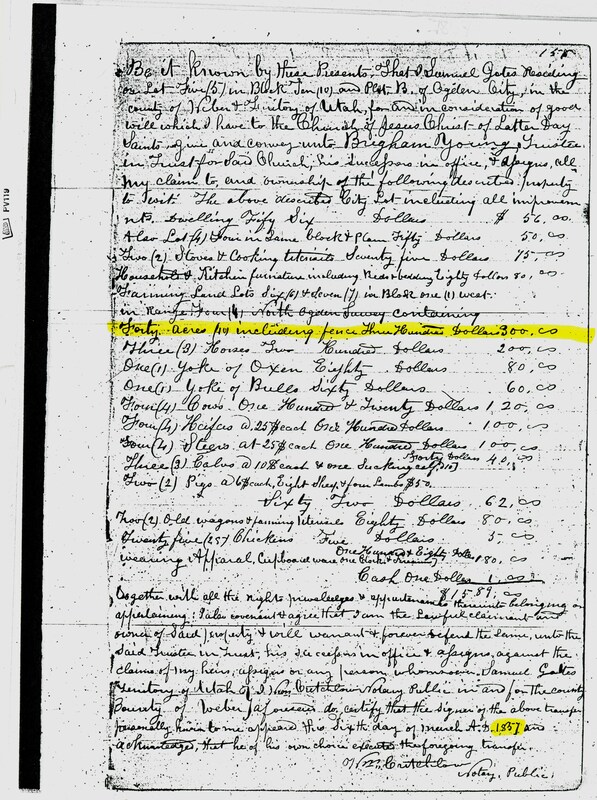 YESTERDAY: Record of Sam Gates’ farming land, April 2, 1853. This land had water, grasses for pasture, and rich soil; this was a prime area for both cultivated and meadow land. From 1850 to about 1855 land claims were free to the settlers, but in 1857 Sam Gates’ 40 acres were valued at $300. YESTERDAY: Sam Gates’ 40 acres were valued at $300 in 1857. 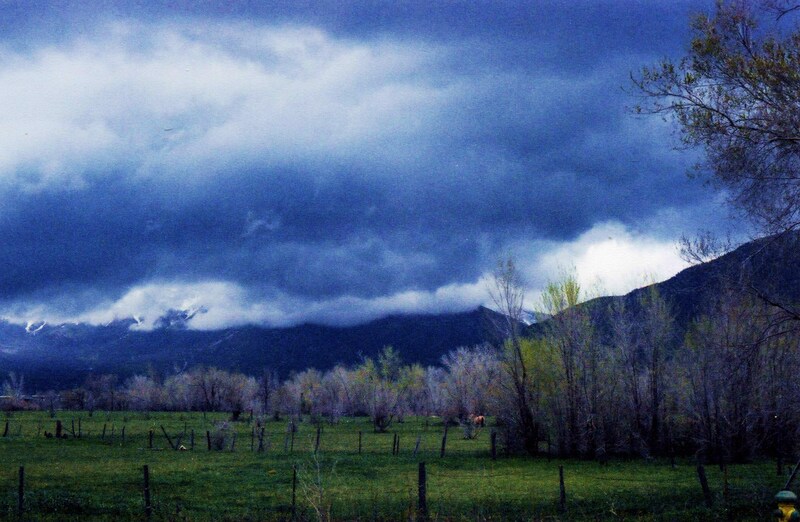 Today Sam Gates’ 40 acres are the Fort Bingham subdivision. In the 1870s the west half of the Gates farm was sold to James Stone. All of this acreage was farming land for more than 150 years. 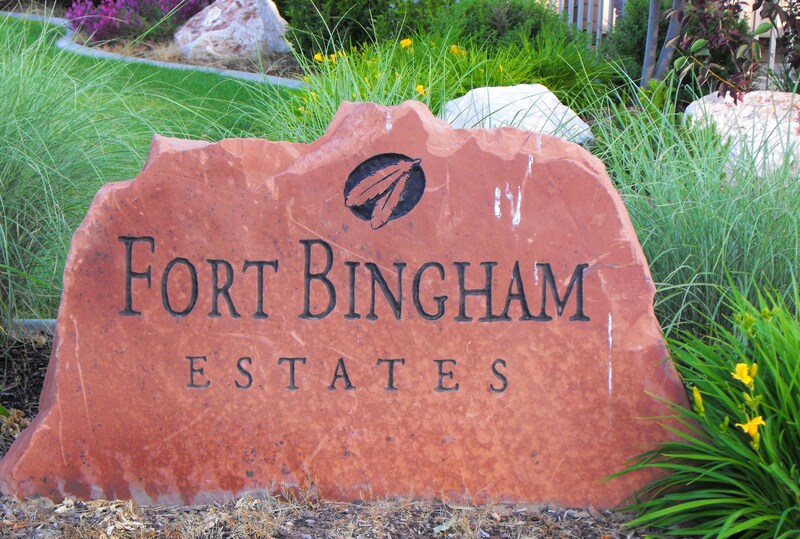 TODAY: Fort Bingham Estates. The land of the subdivision was first claimed by Sam Gates in 1853. Following are some farm pictures of the Fort Bingham area prior to the building of new roads and homes. South portion of Fort Bingham (phase8) was pasture in 1998. NE portion (phase 4) of Fort Bingham was alfalfa in 1997. 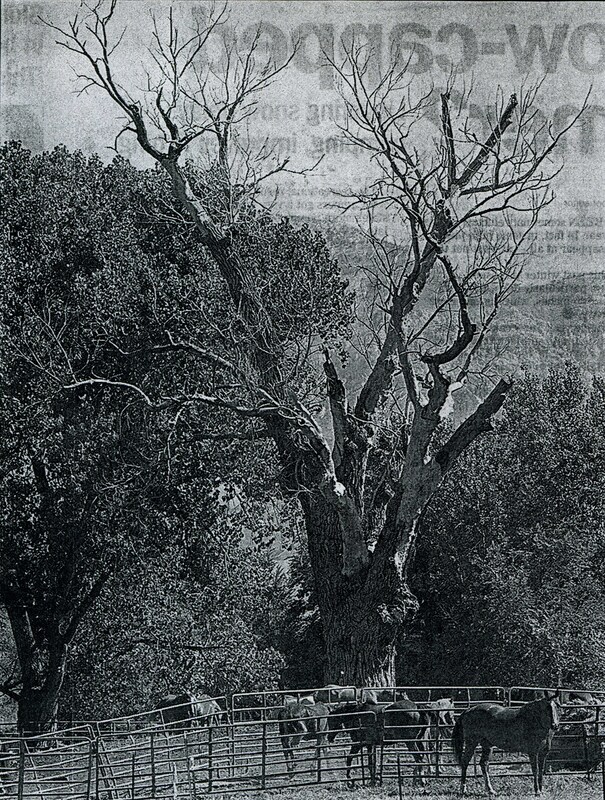 The Indian Tree stood on the site of 145 Century Dr.
South central lane in 1997; photo courtesy Bridget King. Southwest portion of Fort Bingham (phases 5 & 6) was pasture in 1983. 1983 view of old Gates/Stone Farm taken from crossing of railroad track on W. 2nd St. The fire hydrant is still there 2015. This entry was posted on October 11, 2010 at 7:26 pm	and is filed under 7. ROADS IN FORT BINGHAM. You can follow any responses to this entry through the RSS 2.0 feed. You can leave a response, or trackback from your own site.